Dursley's futuristic new library has actually opened at last! It's been a somewhat contentious journey to get to this point and the external design has had its fair share of critics but inside it does provide modern and bright surroundings. Two public events in the town occurred in February, the first was the Dursley Dozen race in which over 400 hardy souls turned out on a cold and damp day to take part in a strenuous run up and around Stinchcombe Hill. Later in the month, the annual fancy dress pancake race took place in Parsonage Street. This year, for the third time, it was won by Trevor Rumbelow. Elsewhere in the town, progress continues on Uley Road with preparations for the new road junction. In Cam, the closure of the High Street continues to cause frustration to residents and visitors alike. On a cold and damp February day, 412 runners set off from outside the "Old Spot" to make their way up through the woods on to Stinchcombe Hill at the start of Dursley's annual 12 mile race. The winner was Vito Graffagnino in an impressive time of 77min 13sec. It's been a year in the making and much longer in discussion but the new library opened its doors to the public for the first time on February 6th. A close up of the entrance to Dursley's library on May Lane which is now seeing large numbers of visitors. 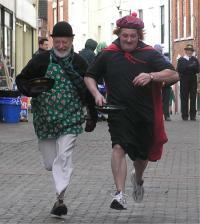 Matt Welsh and Trevor Rumbelow go head to head at Dursley's fancy dress pancake race. Trevor was the eventual winner with Matt a close second. Always popular with onlookers, the race raises money for the Open Door Club, a charity for local people with learning difficulties. Runners are required to toss their pancakes three times while running up and down Parsonage Street. The new junction on Uley Road, which will take traffic into the Crest-Nicholson housing development, is now nearing completion. The temporary lghts have gone allowing vehicles to pass in both directions simultaneously. The main thoroughfare through Cam is now in the middle of a 12 week closure period as Severn Trent dig up the road to lay in new sewers. Diversionary routes, particularly Manor Avenue. are seeing very heavy traffic.